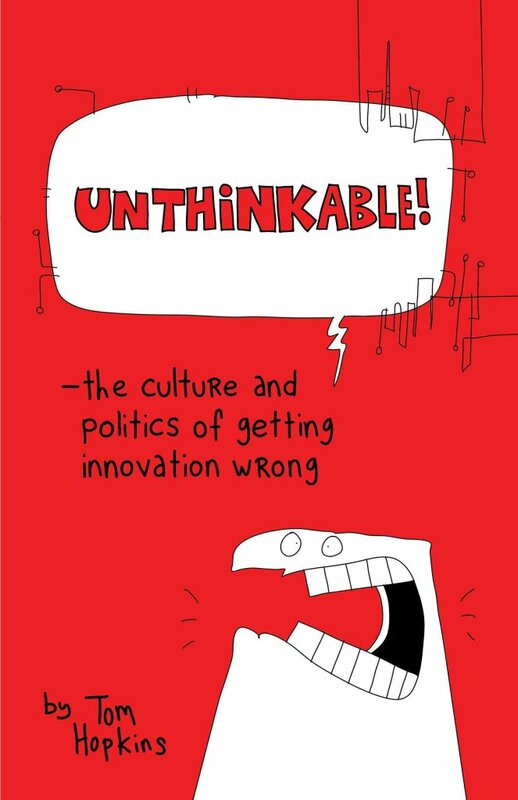 Ken Robinson (presenter of the excellent TED talk ‘Do schools kill creativity‘) has recently appeared onto the web in another presentation at London’s RSA on how paradigms need to change in education to keep up with the changing circumstances we face in society. (It’s a long talk at 55 minutes but well worth setting aside the time). This talk comes a week or so after an interesting story in The Economist into what – if anything – can be learned from looking at schools abroad (paywalled). In that piece, the Economist urges caution in merely borrowing shiny snipets from foreign education success stories, advising instead that education departments should look to leading performers (such as Finland) to understand the harmonious and aligned nature of the ambitions of unions, teachers, parent the government and so on, as well as the underlying cultural difference which underwrite much of the education success. Robinson’s take is startlingly different. He’s sees he problem as requiring a fundemental change in approach. Our current system, he believes, is highly influence by the Enlightenment (a belief in the superceding power of reason) and the industrial revolution. Because of that background, our system is orientated around producing workers fit for an industrialised society. And, until recently, it has also been tightly geared to producing them in the right proportions: lots of workers, some middle managers, and a few doctors and lawyers. Isn’t this exactly what school intake felt like, even as early as 11? As a class-decider? Wasn’t that even what it was like 10 years ago, getting through university admission. But now, Robinson argues, when we are unable to make confident predictions beyond next Tuesday, we should be looking to educate children more broadly in adaptability and creativity; we should be looking to remove our prejudices about the differences between vocational and academic; and we should be very wary of training lateral thinking out of our children. The school system, Robinson maintains, is also often very faddish. Is ADHD really on the rise? Robinson points to a map showing incidence of the problem in the US. What we see is occurence strongly correlated to particular states where we would expect the most information overload. It is, in fact, he argues an epidemic of the faddish sort amongst parents and teachers. Echoing some of the thoughts in Faris Yakob’s ‘I believe children are the future‘, Robinson points out that humans are the only species that imagines things; the only race that tries to predicts it future, or understand its position in the cosmic scale. And that this imagination should be cherished and encouraged, not stubbed out with Ritalin and other supressant drugs. As usual, Robinson is incredibly engaging, amusing and insightful. But for me, the most interesting thought was about the concept of current schools as ‘industrial’ artefacts – not just in the structure of their output but in their methods and practices. 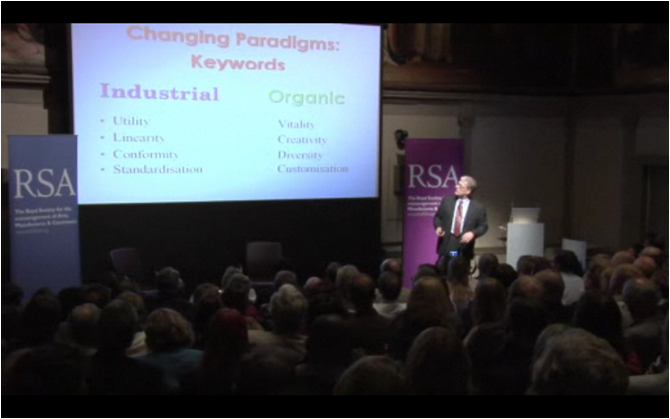 In his talk, Robinson suggests that perhaps we want to return to something more organic (or agrarian?). How do schools actually work? In many ways they do appear to echo mass-production industrial practicies. Children are batched through, they are treated in very standard ways. Defects are collected together at the end of the line, individual workers (teachers) do not necessarily have the ability to respond to different circumstances differently, the ciriculum is the same for every child (Henry Ford’s: ‘any colour, so long as it’s black’). And, so, to come back to my other pet topic – should we actually be thinking about how we can learn from lean to empower teachers (as a group, not just as individuals) to create more individualised schooling, or to do more to shape the schooling which is available more to the individual child (engineering challenge I guess in Lean) that comes into the system. And how also can we minimise the inventory effect (grouping pupils by age in Robinson’s language). Want to try some more Lean principles? What about: ‘deliver as fast as possible’; ‘amplify learning’ (from one pupil to the next); ‘decide as late as possible’ (that’s certainly not something that’s made it into schools in this country); ‘see the whole’; ‘build integrity in’…. The answer appears to be about allowing much more flexible teaching and marking to foster exactly the sort of creativity most kids are born with. Let’s hope Robinson keeps on his crusade. And the educators start to learn from this – more radical -thinking, rather than just borrowing from our neighbours in Europe and the US.